from carbs to Whole30 to eating for 2 : adapting my diet to lifestyle changes... plus, a recipe! When I started the blog in early 2014, my original intent was to share my designs, recipes and inspiration. At the time I was (and still am!) in love with making up recipes for anything and everything, heavily revolving around starches and grains. I was accustomed to cooking with Israeli couscous, orzo, risotto... if it was in the starch family, I was all over it. I thought I was healthy, but my body felt otherwise. In early 2015 I finally decided to try the Whole30 and give my digestive system the support it needed. I temporarily gave up grains, legumes (a main source of protein for me at the time), dairy, sugar and alcohol for 30 days. It sounds easy, and it is, in essence, but it was a huge challenge in shifting my emotional relationship with food, and moving away from my go-to "healthy" staples like the recipes I used to make. If you're interested in reading more about my experience, here are a few posts: week 1 recap, week 3 recap, and my overall recap. While I hadn't switched entirely to a Paleo diet, I did put in place several things I learned while on the Whole30. I increased my protein, having a hardboiled egg for breakfast every morning, and tried to eliminate dairy - sneaking in delicious goat / mozzarella / feta cheese when I wanted. The biggest takeaway for me was knowing HOW I'd feel after eating certain things, rather than trying to guess what the culprit was or just recklessly eating things I knew would upset my system. I ate less legumes and grains. I also tried to cut down on my sugar intake, reminding myself how I'd crash and feel terrible after a bag of Skittles, Sour Patch Kids... etc. All a total guilty pleasure! Since I had changed my diet, I posted less and less recipes. It made me sad to deviate from my original vision for the blog, but my diet constraints made me feel less creative and willing to share recipes. I stuck with the new "diet" (I really do hate that word) for about a year and a half, until I found out I was pregnant. At that point, my outlook on my diet and my relationship with food changed again, now knowing I wasn't just eating for one! Now that I'm 6 months pregnant (! ), I've found that my system is adapting to dairy, grains and legumes once again. Many people experience a change in food tolerances and sensitivities while pregnant, and I've been lucky to benefit positively from that. It also gives me peace of mind knowing that our little peanut is getting all the calcium, carbohydrates and other nutrients I wasn't consuming - or consuming in limited amounts - prior to being pregnant. Other things I've been eating and can't get enough of lately? 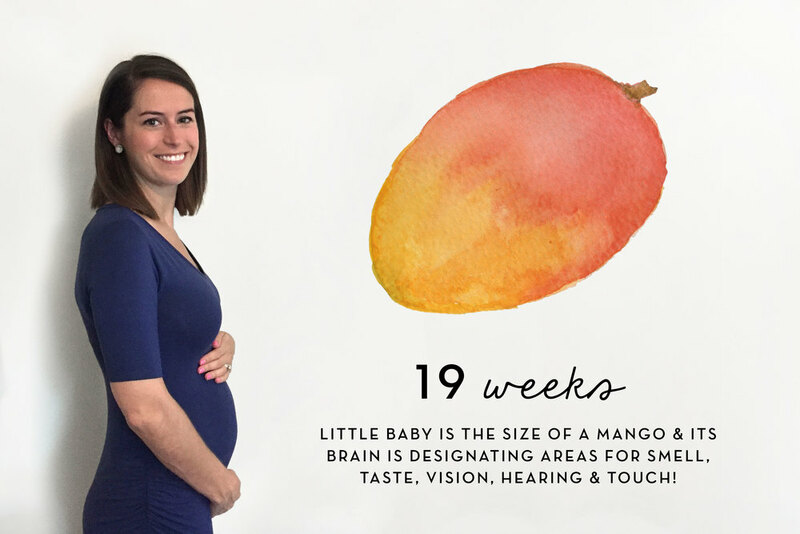 First Trimester: My all-time favorite food was grapefruit. I could NOT get enough! I'd have a half or a whole grapefruit for breakfast every morning. They are rich in folic acid so it was a win-win, knowing I was indulging in a (healthy!) craving and giving our peanut a little brain boost. Second Trimester: I've moved on from grapefruit and am fully obsessed with cantaloupe. Before I was pregnant, I loved cantaloupe but would always have a mild allergic reaction afterwards (itchy throat and ears). I gave it a go again and I was SO excited to find out I could eat it without any allergic reactions - to the point where I could eat an entire cantaloupe in one sitting if it wasn't completely excessive. I also crave raspberries and fruit popsicles, so I think it's safe to say this little peanut loves healthy, fresh (sweet!) foods. Cook pasta according to package instructions. When noodles are al dente, drain pasta and allow to come to room temperature (or run under cold water). In a small mixing bowl, whisk together all Dijon vinaigrette ingredients and set aside. In a large mixing bowl, combine red onion, tomato, peaches, bacon and white beans. Add pasta (once cooled) and dress with Dijon vinaigrette. Add basil and stir to combine. Serve immediately. *Note: the Dijon vinaigrette is the brightest and most tangy when served immediately. When refrigerated overnight, the vinaigrette flavor subsides quite a bit and becomes really mild. It's a wonderful feeling when a bride not only has a specific design in mind for her wedding invitations, but a palette that includes blush and gold foil. Swoon. Needless to say, I was thrilled when my friend and old co-worker Michelle reached out to me to design her invitations back in October of 2014. I had brought in my own invitation suite when Kelsey and I partnered to design her wedding invitations, and Michelle flattered me by asking for the same look and feel of my own. In an effort to give her invitation suite a look that was all her own, we explored several brush scripts before landing on Kailey, the oh-so-gorgeous typeface that I had selected for my invitations. 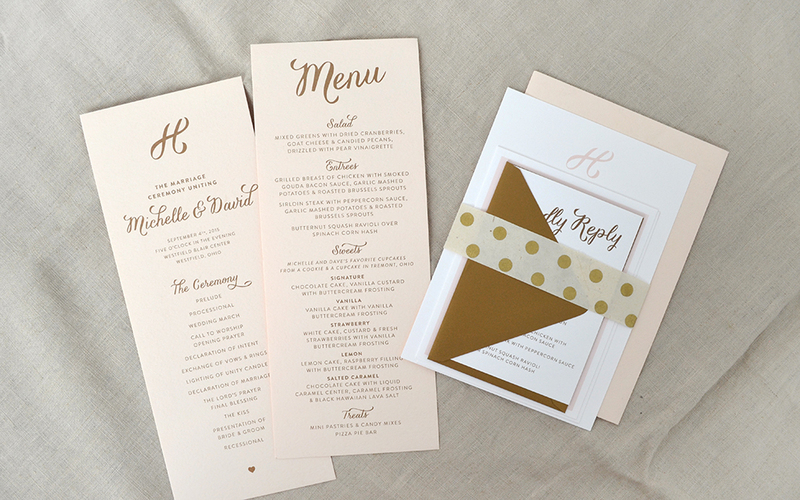 By adding blush tones, a monogram and more emphasis on gold foil, Michelle and Dave's invitation suite quickly became their own unique, romantic suite. 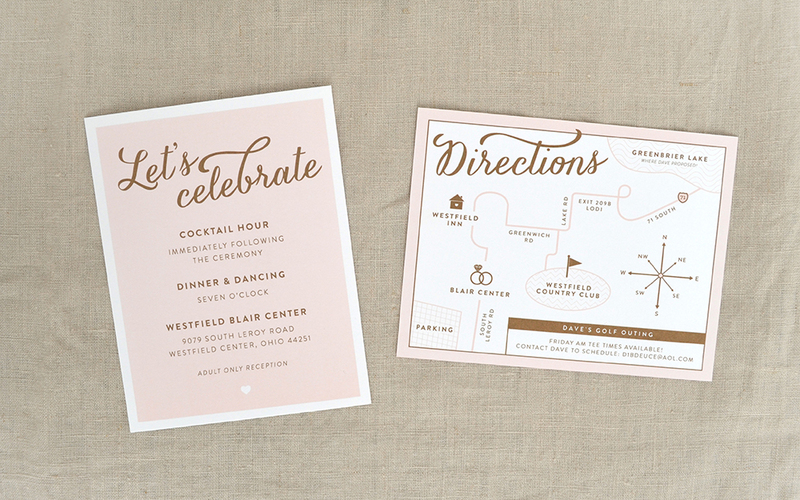 The invitations were printed offset with blush and metallic gold Pantone inks on a smooth white stock, while the menu and program were printed with metallic gold ink on an incredible blush textured stock to match the envelopes. Michelle and Dave's suite featured playful yet romantic features like an allover heart pattern on the back of the Accommodations card, playing off of the heart on the main invitation, along with a custom map that included directions for the big day (highlighting Dave's tee time - very important for the guys!). The subtle detailing of the metallic ink with the shiny gold foil complemented the blush tones in such a romantic way, and teased the palette for the wedding itself. In addition to the invitation suite, program and menu, we also designed placecards and various signage throughout the reception (a favorite was the Malley's sign on the candy bar... yum). I mentioned the swoon factor before, but as soon as Michelle told me that her wedding dress was blush lace, I about fell off of my chair. She had the clearest vision for her day - romantic, glamorous, sweet - and everything fell into place beautifully. Thank you to Michelle for allowing me to play a small part in your big day!